Abby Wambach concussion: The women’s soccer start got hit in the head and stayed on the field. For shame. Abby Wambach got hit in the head and stayed on the field. For shame. 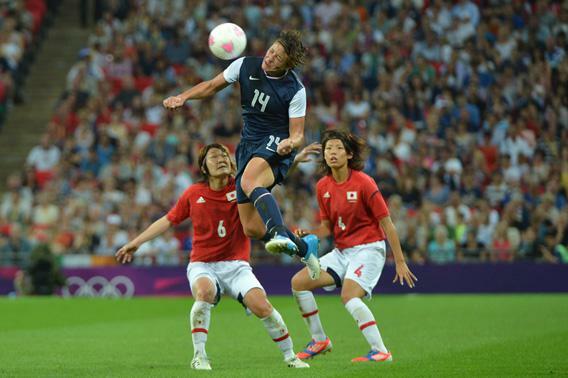 U.S. forward Abby Wambach heads the ball during the women’s soccer final of the London Olympic Games on Aug. 9, 2012. On Saturday night, in the 90th minute of a game between the Washington Spirit and the Western New York Flash, Abby Wambach took a ferocious ball to the head. The Flash striker, and the biggest star in the latest incarnation of a women’s pro soccer league, wasn’t trying to score. She was struck by a line-drive clearance by a teammate just a few yards away. Wambach toppled like a tree and rolled into the fetal position, grabbing her head. One of the game’s broadcasters chuckled, noting that “these last couple minutes have been a bit chaotic.” The referee, Kari Seitz, a veteran of four women’s World Cups and three Olympics, raised her right palm to stop the Flash’s trainer from coming onto the field. After half a minute, Wambach stood and took a few tentative steps. Play resumed. The Flash moved the ball downfield and, in a last-second attempt to break a 1-1 tie, Wambach tried to score off of a corner kick. Using her head. Wambach was escorted to the bench. A trainer kneeled in front of her for several minutes. He helped her stand and, with his hand on the small of her back, they walked slowly across the field and back and sat down again. When they left, Wambach didn’t lift her head to acknowledge the fans shouting her name. For every step forward in recognizing and treating brain injuries in sports, the jock culture takes a step backward. The episode involving Wambach was as disturbing as any in the padded and helmeted NFL, and the message it sent to the 4,569 fans who filled the suburban soccer complex—maybe a third of them girls, including my 10-year-old daughter—was worse. Why? Because Wambach is her sport’s meal ticket. Because young athletes, including those who witnessed her collapse in a lifeless heap, want to be like her. Because she is a woman. Wambach is women’s soccer’s reigning world player of the year, an award conferred by the sport’s international governing body, FIFA. She is just four goals from breaking first-generation icon Mia Hamm’s (male or female) record of 158 goals in international competition. Hope Solo and Alex Morgan might be the national team players that soccer bros objectify, but the 32-year-old Wambach is the tall, tough one leaping for balls in the box, the leader shouting at teammates and calling out opponents, as well as the go-to postgame interview. I’ve been to a lot of women’s soccer games, and Wambach jerseys and “Abby! Abby!” autograph requests rule the crowd. After Saturday’s game, as Wambach sat with head bowed on the bench a few feet away, a group of girls slightly older than my daughter repeatedly called her name. When Abby left, the girls left, too. So what Wambach does on the field matters. If she stays in a game after sustaining a blow to the head from a ball traveling 50 or 60 mph, is she demonstrating, as Washington Post soccer writer Steven Goff put it after the game, why she is “[r]enowned as much for her determination and courage as for her scoring feats”? Or is she just being foolish and encouraging young female athletes to follow her example? It’s not a stretch to say that Wambach and everyone else on the field at the Maryland SoccerPlex—teammates, opponents, referee, coaches, trainers—were reckless with the health of a player. Not a single person appeared willing to do what medicine and common sense have shown to be the sensible thing in similar situations: bench an athlete who has suffered a blow to the head—meaning the brain—that may have compromised her physical condition. Whether the ball ultimately did or did not concuss Wambach is beside the point. She needed to be examined. What if she had been cold-cocked again a minute later? The National Women’s Soccer League says it’s not. A spokesman said the league follows the concussion guidelines of the U.S. Soccer Federation, which organized and is partly backing the league. The guidelines state: “Immediately remove athlete from participation if concussion is suspected.” It was certainly possible that Wambach could have been concussed. Did game personnel just fail to follow the guidelines? Or did Wambach stay in because she’s Abby—as important as anyone to the fate of the third women’s league in the last decade—and got the benefit of the doubt from the ref? All of which is true enough. But why trust a ref when a medical trainer is a few steps away? Why not send an important message to all those Abby fangirls and say the league made a mistake and that Wambach should have come off? Since Mia Hamm, Julie Foudy, Brandi Chastain, and their peers legitimized and popularized women’s soccer in the 1990s, the sport has played the role-model card to great effect. The walls of my daughter’s room are decorated with an 11-by-17 photo of Alex Morgan and a montage of snapshots of my daughter with other players, including Wambach, who generously make time after games to pose and sign. In this instance, instead of telling girls that head injuries can be dangerous, Wambach and those around her encouraged them to play on. That’s especially relevant for girls. Studies have found that girls and women who play the same sports as boys and men sustain more concussions and recover more slowly than their male counterparts. While the science isn’t definitive, researchers believe a main reason is that female athletes have weaker neck muscles and less neck mass than male athletes. When a female head gets hit by a ball, an elbow, another head, the goalpost, or the ground, the neck rotates faster than it would in a male, increasing the force of acceleration. “Rotational effect is what we believe is potentially causing females to have more concussions than males,” said Tracey Covassin, an associate professor of kinesiology and concussion researcher at Michigan State. Covassin told me the size of a soccer ball relative to the size of a female head also may play a role, and higher estrogen levels may, too. Whatever the causes, elite players like Wambach—who has used her head to score about 40 percent of her international goals—might want to highlight the potential risks rather than blow them off. In a 2012 article about professional soccer player turned concussion awareness advocate Taylor Twellman, the Los Angeles Times wrote that Wambach “flatly dismissed the threat of concussions.” “I feel OK. I love what I do,” she was quoted as saying. “I don’t think it’s harmful to me or my body.” After the 2011 Women’s World Cup, she joked with David Letterman about heading—“Yeah, you’re heading the ball, may cause some trauma”—and her dramatic game-winning header versus Brazil. “Being dumber for that moment is OK in my book,” she said. Is it also OK to be dumber for that moment of glory when the Pink Panthers are playing the Purple Piranhas in rec soccer? A 13-year-old girl might not be able to make the distinction. On Sunday, a day after she got hit in the head, Wambach tweeted a photo of Ashlyn Harris waving for a trainer while Ali Krieger, who plays for the Spirit, looked on with concern. “I’m all good here everyone. Thanks for the well wishes,” Wambach wrote. But she wasn’t “all good,” not in the moment and not afterward. She didn’t practice Monday despite reportedly passing concussion tests administered that morning. “I feel positive about the progress I’ve made in the last 48 hours. That says a lot about maybe my hard-headedness, but also about the medical staff that we have [and] the protocol that’s set in place by the NWSL,” Wambach said. She also declared that, while “you do have to be cautious,” she was determined to suit up this coming Saturday for the team’s home opener. On Wednesday, a Flash spokesman said Wambach was “day-to-day” and “probable” for Saturday. The spokesman declined to say whether Wambach had returned to practice. Harris had said after the game that Wambach “is just relentless and not going to take herself out.” Most great athletes are and won’t, and as a culture we honor that. But think of the impact Wambach could have had if she had admitted to her 240,000 Twitter followers that she was injured against the Spirit and was wrong to have stayed on the field. If she’d done that, using herself as an example to caution youth players to take head injuries seriously, that would have been far more courageous than finishing the game.